A rainy day here in Southeast Ky. provides me with the first chance to “stop and smell the roses” in a couple months. It’s been the proverbial “rat race” here since Farm I got it’s first shipment of birds on Feb 28th. I always take extra pains getting the birds adjusted to their new environment and making sure the equipment is all functioning properly. Typically I work every day, at least during “feed time”, to make sure the hoppers are emptying equally and all the birds are getting the right amount of feed. It usually takes me until Farm II is receiving birds to have everything like I want it and then I start the process anew. This year that was April 23rd. I get very little time off until the birds get through their peak production. 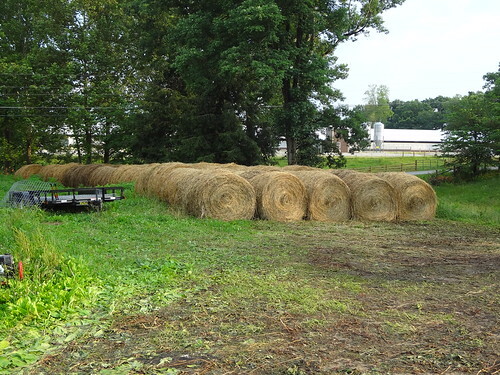 This year we haven’t even gotten to peak production at Farm II before hay season started. All indications are this is going to be a great hay season too. I’ve picked up a couple more farms on lease. One is about 48 acres and the other is 20 some. We are almost done with the first cutting. About another 3 good dry days will get it all wrapped up. As of now we have 138 4×5 rolls from the first cutting. That’s more hay than I generally cut in a year and the first cutting isn’t done yet. 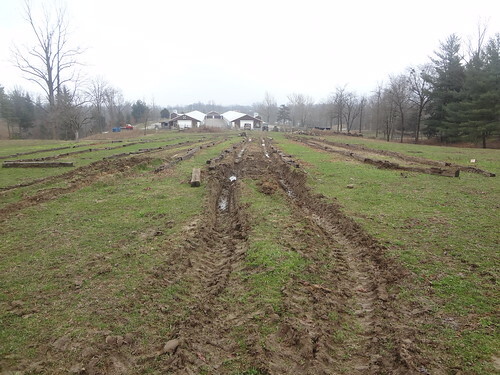 One 4 acre field we have really been working with here on the farm netted us 18 rolls. That’s a great yield. The other 30 acre farm we’ve had leased for the last 3 years netted us 54 rolls. I remember the first year we cut that farm we got 15 rolls. That’s a pretty good increase in production in 3 years. Chicken litter really makes the grass grow! We’ve been going almost non stop cutting with the 6000, raking and fluffing with the 3316, and rolling with the 7010. The more I use the 7010 cab and the Vermeer roller the more I like them! My plan is to square bale a bunch of the 2nd cutting. One evening last week we took on a rescue horse. The poor thing was starving where they were keeping it and the boys did the right thing and ask us if we would take it and take care of it. The kids have named it Millie. Slowly it seems to be getting back in shape. At this point I am afraid to feed it much grain so we’ve basically just wormed it and let it pick with the goats. It seems to appreciate our efforts. My dad said he didn’t think it raised it’s head for 36 hours. We’ve had a good kidding season this year with our goats too. At last count we had 13 kids. Some does have already kidded the second time for the year. 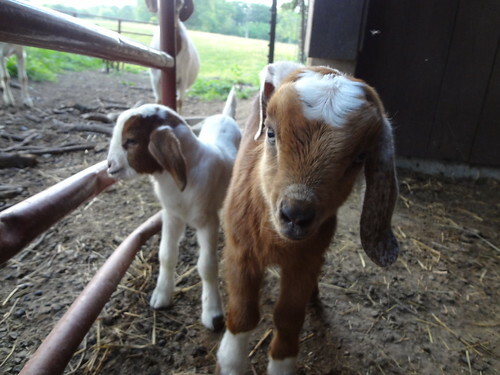 With a goats gestation period of around 150 days it’s possible to get 2 kidding’s a year from them. We’ve gotten a couple calves since I posted last too. Cows are by far the least labor intensive thing we have here on the farm. I’m seeing some pinkeye this year for the first time though. I’m planning to purchase a Tarter Gates squeeze chute for working with the cows. It’s just too risky trying to vaccinate and treat them by hemming them up in a corral. The 3316 HST has been hard at work in the garden laying off rows, hilling, and cultivating when it wasn’t raking and fluffing hay. We’ve got every vegetable imaginable in the works and it takes every available evening hoeing and cultivating to keep the weeds out of them. My aunts from Ohio and Pennsylvania have both requested several bushels of green beans to can so I’ve tried to take extra special care of them. The corn is looking good so far too. That’s one of my favorites, corn on the cob. I can’t wait for real tomatoes either. These things they sell in the store can’t really be considered tomatoes. I guess I’m a real country boy because in my book it doesn’t get much better than fresh garden veggies. Our berry patch is finally netting us some wonderful strawberries too! I think papaw eats them everyday. I know I would go broke if I was getting paid to pick them. I eat more than I pick. Blackberries should ripening soon too! Most days I run like crazy and don’t get a chance to stop and realize this place really is coming together. The added acreage this year has had me re-evaluating my equipment. While I’ve been pleased with the 6000 I’ve come to the ultimate conclusion that it has outlived it’s usefulness here on the farm. I currently have it listed for sale and if it sells I’m planning to take advantage of Mahindra Dealer Days specials and pick up a 5035 PST. I initially was set on a 4035 PST, but there is such a small difference in size between them that I feel I should opt for the 10 more hp. The price point on the 8560 cab is really tempting too. I’ve looked the big tractor over several different times. I just wish the scope of my operation was bigger so I could justify the purchase. For now I think the 5035 will take on some of the tasks I’ve normally used the 7010 to do. My next 2 purchases will be a hydraulic fold 8 wheel V rake and a 4 basket tedder though. The 5035 can then take over the hay duties the 3316 is currently performing. As the old saying goes, “time is money” and I should be able to cut my haying time roughly in half. Well as always I have a ton to do and it seems the rain has passed so I guess I should move on to something else that needs doing! Thanks for taking the time to follow along. There’s much more to come so check back often! I’m trying my best to keep the Combs Farms Facebook page active and updated. I’ll be uploading pictures frequently both to Facebook and Flickr so even if I’m not posting here feel free to take a peek at the pics! Again thanks for reading and God Bless! 2012 is here and after a busy 2011 I can honestly say I am glad. 2011 was one of the craziest business years I’ve ever experienced. Barely 5 years into this poultry adventure we find ourselves upgrading. Technology changes so fast there is always something new to add or update to keep things “state of the art”. Of course the capital investment is difficult to stomach, but when you have one customer I guess it’s important to try to keep the peace. Technology doesn’t seem to be the only thing that changes in Cobb. In 5 years I find myself dealing with both my third service technician and my third complex manager. I also find myself unhappy with the business for the first time. I’m beginning to understand that corporate agriculture is no different than corporate manufacturing. It’s all about cutting cost. Cobb contracts a lot of things and we as contract growers find ourselves at the mercy of these contractors. If Cobb can save a few thousand or even a few hundred dollars per farm with a new contractor their business model is such that they do just that. I have no problem with cutting costs, the problem comes in when the new contractor only has to do a certain percentage of what the old contractor was doing and the rest gets pushed on down to the farmer. Not to mention Cobb doesn’t feel responsible when their contractors steal your things or damage your equipment. In particular Cobb has decided to change “wash crew” contractors. The new “wash crew” contractor bids the job cheap enough to get the contract by saving Cobb money, but they won’t wash the nests. That’s no problem for Cobb. They save money. Then they dictate to the farmer that they now have to wash their own nests. When the farmer objects Cobb simply says “you’ll do it or I won’t bring you any more chickens”. I never experienced this blatant breach of contract or disrespect in any other environment without feeling I had recourse. It’s very difficult for me as a person. In this business you are a slave to the guy who spends 3 days a week in an office, half a day a week visiting farms, and takes 3 day weekends to golf or fish or spend with his family. All the while you give up those things in an effort to survive financially. I don’t mind to work. I don’t mind to work every day. I don’t mind missing a few functions with my children. I do mind being disrespected and feeling forced to do something I didn’t agree to do. Our contracts are written by attorney’s that work for Cobb and yet they specifically state “The Company agrees to furnish the Producer with spray material, spray equipment and labor to sanitize the Producer’s houses and/or buildings at no cost to the Producer”. I can’t help feeling as though we are on a slippery slope here. At this point it’s not enough to fight over, but I am seriously concerned this has started the ball rolling. There never seems to be enough hours in the day to get things done. I’ve been feeding chickens at 5 am, gathering eggs til 9, and heading next door to work on upgrades til 4 or 5 every evening. Just this year we’ve added stir fans, attic inlets, 36″ minimum ventilation fans, 16′ roll seal doors, blown in almost 10 pallets of cellulose insulation, and we still have to work on our slats and drinkers. After that there’s cows, horses, rabbits, and goats to feed. Luckily most of the kids activities are on weekends now so I haven’t missed many of those. We’ve been taking a break from the upgrades on weekends. Working 5 or 6 hours on Saturday and Sunday seems like a day off. Madison has had basketball most weekends. This week should wrap up her AAU league play. Every spare minute she has you find her at the ball goal shooting away. She runs through the house jumping and going through shooting motions. It’s almost as though basketball has possessed her. Kaylee cheers all the high school games so Madison and I watch and critique most of them. Garett is growing tall, but still has no interest in sports except baseball. He has however shown some interest in band. He also told me he would like to have a greenhouse and grow flowers and vegetables. Madison and Garett are both still enjoying jujitsu. Kaylee and Katie are still typical teenage girls who don’t have much use for dad until there’s a problem with their cell phones or they need money, ipods, or clothes. I guess that’s pretty typical of teenage girls. All the kids are doing good in school and haven’t had any discipline problems so I guess so far so good. With all the upgrades and cleaning out at farm 1 the 7010 cab and the 3316 HST have been getting a pretty good little workout. The 7010 has hardly sat still between feeding rolled hay to the cows, loading out 2 houses of litter to be spread, unloading all the equipment we used in the upgrades, lifting the roll seal doors in place and holding them while we attached them, and hauling the slats to the field to be washed. The 3316 is great inside the poultry houses. The HST makes it a breeze to push the litter to the center were it can be reached. The constant back and forth in such a small space would be a lot more work with a gear transmission. I’m still itching to try the new Power Shuttle transmissions. I think they would be a great fit for a 3rd tractor here that would see limited use in tight spaces. The 6000 4×4 is a great utility tractor, but we just don’t use it like we did before the 7010 cab. For months now I’ve planned to put it up for sale, but after work and activities with the kids I’ve barely found time for sleep. Jan 2012 is the last month of a payment for the 7010. Couple that with selling or trading in the 6000 and I can see an 8560 cab in my near future. I’d pull the trigger now if I could find any need for it. It’s a real balancing act trying to grow a business and have the equipment you need to do the work without buying things you don’t really have a need for. As the title of this posts suggests I’ve made some resolutions for this new year. One of those is to keep this blog current. I should have a real opportunity to do that with no chickens coming back to Farm 1 until February 28 and Farm 2 selling January 8. Although there’s still work to do it should allow time to do some other things too. I’ve set up a Facebook page for the farm and I’m working on a Twitter account. There’s still the Flickr account that has tons of photos to see. I’m hoping to transfer the photos to Facebook too. There’s also YouTube that’s a work in progress. All in all I’m stoked about making this a pretty cool adventure. Here’s the kicker though….It’s no good without feedback! So please comment here, there, and everywhere. Here’s wishing all you much success in 2012! Ever feel so overwhelmed with things you want to scream HELP? That’s exactly how I’ve felt lately. Since September 18 we’ve had our sell date pushed off every week, now til October 23rd. We are down to 3 employees on the farm now and it’s thrown us all to a 7 day a week work schedule. Somehow we are making it. We’ve managed to get the second cutting of hay wrapped up along the way. The highlight of haying this year was the addition of the New Holland 570 square baler. After putting up 400 square bales we have affectionatley named them “idiot cubes”. There is so much work in squares it sure makes you wonder if it’s worth it. I didn’t have but a little over 100 rolls this year so the squares should help us stretch the hay through the winter. I’m thinking that the drought in the Southwest combined with flooding in the Northeast will cause cattle prices to decline pretty significantly this winter. If that’s the case I’m going to try to pick up bred cows or cows with calves by their side. I’ve sold off all my calves except the 2 smallest. If prices stay up they will go by the end of next month. Just as I thought calving was over for the year I noticed a new black speck in the pasture. After thinking about it and checking the calendar I realized it’s time for it to start again. So far we have 2 beautiful black specks streaking across the pasture and giving chase to the bigger calves. It does my heart good just to stop and watch. I’m thinking this will be the last year we keep JR. our bull. He has gotten so big we can’t handle him. He’s plenty gentle but sometimes that’s a bad thing. He could hurt or even kill you just playing. Just like the calves, the kids are growing by leaps and bounds. Just as Madison’s school basketball season ends Garett’s academic team season begins and Kaylee’s fall football games are in full swing. It seems like every night of the week one of them is at some sort of game or meet. Throw Jujitsu and spare nights at the school practicing basketball and riding bikes in the mix and there’s no rest. Madison has been asked to play in a traveling league this year so there seems there won’t be any off season for her. We’ve decided to wait and see how things develop with Madison before holding her back a year to mature. 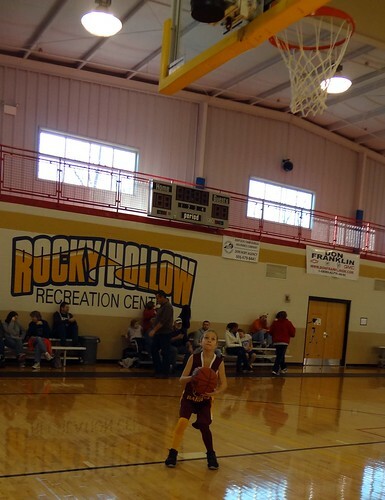 I get a lot of negative comments from people about holding her back for basketball. I always respond it’s not life or death, it’s much more important, it’s basketball and this is Kentucky! Of course I’m joking, but noone should doubt basketball is almost that important to us here in the bluegrass. I know it was that important to me as a kid growing up in these hills and hollers cheering on Joe B Hall and the likes of Roger Harden, Dirk Minnifield, and who could forget the “Twin Towers” Sam Bowie and Melvin Turpin. I want to give her every opportunity to compete at the college level and if being a year older will help her then that’s what we will do. I don’t worry about Garett, he’s ready for college now. As a matter of fact he’ll be taking the ACT in December as part of Duke University’s talent search program. I think maybe I need to be setting the record straight to him early though. He’s from Kentucky and I can’t have him going to Duke. That would be worse than Louisville. We still haven’t forgotten that shot heard round the bluegrass! The tractors are still holding up great! 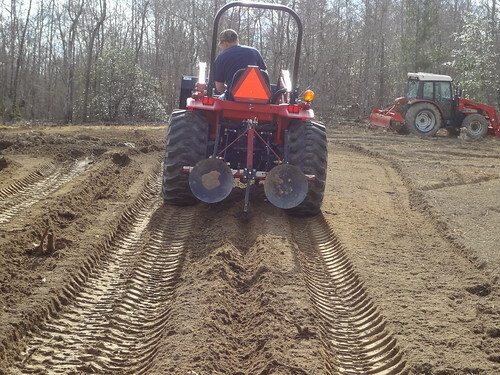 This makes thousands of hours and 7 years of Mahindra tractors and no major breakage on any of the 3. I’m sad about it and hate to see it go in a lot of ways, but the 6000 has outlived it’s usefullness here. It’s just plain too big to use in the poultry houses and we have the 7010 for outside work. It’s really hard to look back and imagine a time when that tractor did it all. It will make someone a great tractor for a small beef cow operation. I try to look at the upside of selling or trading it. A new 4035 PST will be a great second tractor for helping out with inside the poultry houses. 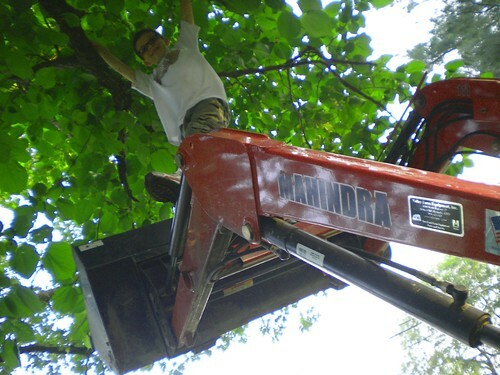 The sloped hood and curved boom loader will make it great for a lot of tasks outside too. I may even go all out and add a 485 Mahindra Bradco backhoe. Of course the apple of my eye continues to be the 8560 cab. 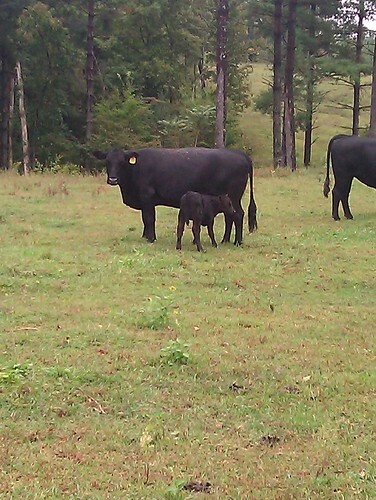 I hope to grow by either buying or leasing land and increasing my cow calf numbers. I haven’t had much of an opportunity to get out and talk to folks about leasing land because I’m seemingly always in with the chickens or gone with the kids. It seems the long term lending sector is pretty much frozen too. Farm Credit Services is very tight with money to expand right now. If anyone knows of another source to try I’d like to hear from them. I’d even be open to rolling my whole note over to someone new. There’s more to do than ever before so I better end for now…be sure to check out the photos and video I’ve added to Flickr, Facebook, and You Tube. Thanks for reading! They say all work and no play makes Joel a dull boy, so I’ve taken the time to have a little fun lately. As I always say though,Â fun comes at a price, and the price has been finding myself with even less time to get things on the farm done. I’ll say it’s worth it though. I had the opportunity to catch the first concert I’ve been to in a very long time. We had absolutely amazing seats to see Miranda Lambert at The Arena in Corbin, Ky.. It was great to relax for a change. We had a nice dinner at Applebees and even dropped by Cumberland Falls to see the falls by moonlight. I’ll say everything just clicked. The music was wonderful. Along with Miranda Lambert we saw James Wesley. James Wesley sings “Real” which Katie says reminds her of me. He’s coming out with a new single “Walking Contradiction”. It’s a good tune, but “Didn’t I” is still my favorite from him. In addition to the concert I took an evening and attended my 20 year high school class reunion. I’ll say that if your 20 year high school class reunion doesn’t make you feel old I don’t know what does, besides maybe your 25th. The only good I see out of getting older is that you get to seeÂ your children grow and mature. Along those lines, Garett has grown up enough that he is becoming really interested in hunting. We’ve been taking a few mornings this month to head out after bushytails. In this part of the country Gray Squirrels were once a staple of folks diets. I’ll never forget hunting these tree dwellers with my grandfather. Here in Southeastern Ky. there wasn’t many deer until recent years so small game like squirrelsÂ and rabbits were very sought after. Times have changed a bunch since my grandpas day. Then everyone hunted and supplemented what they grew or raised with wild game. I’ll never forget granny making fried rabbit with gravy, eggs, and biscuits for breakfast. Madison is back to basketball full swing. Shes’ practicing 5 nights a week unless she has a game. 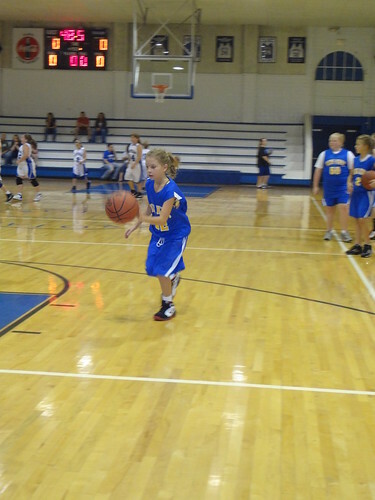 She plays point guard, and I’m impressed with howÂ she’s developing. I wish I had more time to work with her. 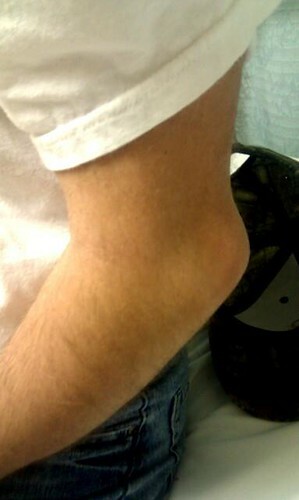 For now I guess I’ll leave it to the coaches and camps. Both my younger kids seem to be hitting the stage where they don’t value dads advice much. It’s tough being dad, but we’ll work through it. 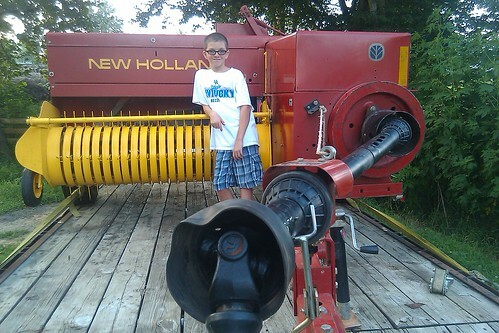 Turning to all things farm…I managed to pickup a pretty nice used square baler. We were all set to spring for a new Massey Ferguson inline baler, but somehow I just couldn’t swallow the prices. We ended up with a nice New Holland 570. It’s plenty fast enough for me. I actually enjoy square baling hay with the 570 behind the 7010 cab. I was concerned that the 7010 was a bit underpowered in the summer with the AC cranking, but I was pleasantly surprised. A little swaying form the plunger, but other than that you can get a huge amount baled and never break a sweat. I’ve finished with all my gardening for the year so we’ve hooked the backhoe back to the 3316 HST in preparation for a renovation project on my grandpas old spring and putting in some new water spickets around the farm. Now if I can just find the time. I’ve stewed over holding on to the 6000 or trading/selling it and finding something a little smaller and more agile for about a year now. I’d really like to have a bigger backhoe too. I can’t help but believe with intrest rates as low as they are at the present now is the time to trade/buy. Depending on our tax situation this year I can start seriously talking to dealers about an 8560 cab somewhere in the November to January time frame. Well as always I better be getting back to work. If you haven’t already, be sure to add me on Facebook. Just look for Combs Farms and send me a friend request. I’ll be adding more pics to the Flickr site as I get time, but you can usually get them quicker on Facebook. Thanks for reading and God Bless! A few weeks back we picked up a cheap 1982 Chevrolet litter spreader truck. After towing the truck 3 hours we (mostly my dad) have worked almost every day trying to get it ready for the upcoming house cleanouts. We’ve replaced the back brake shoes, brake lines,Â master cylinder, plugs, wires, and coil. We also cleaned the carburetor, took a couple links out of the drive chain,Â and swapped out the seat. We’re a long way from done, but we did get a chance to see how it was going to work out. Our first attempt went pretty well aside from my major concern. 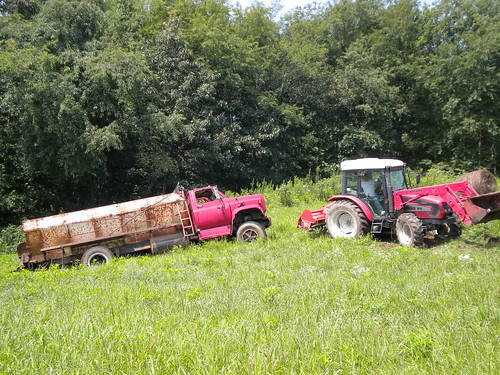 I had pushed for a buggy type spreader to be pulled behind one of the tractors because I was concerned a truck wouldn’t navigate our hilly terrain very well. The truck spreads great, but with just a little spinning of the tires it buried itself to the axle. After a couple chains and tethering the 7010 and the 6000 to the truck we finally got it unstuck. Not exactly how I wanted to spend my day, but now we all know what we are up against. Looks like our next step is some more agressive tires. It did make for a lot of laughingÂ at ourselves andÂ some interesting pictures and video! I finally got my goats in to the processor. I’d forgotten how much I like the goat burger with egg noodles and cream of mushroom soup.Â It will be nice to have my warm goat concoction for lunches this winter.Â The pigs are growing fast. They are big enough now that they make a pretty good mess so I’ve been hosing out their pen everyday. They seem to appreciate it. It’s been miserable hot lately. We, like alot of the rest of the country, are getting cooked. Everyday when I hose out the pig mansion and they run and squeel through the water I notice the cows all taking a dip in the pond. Unless I decide to buy more cows we only have one left to calve this year. Sheep cow, as she is affectionately called here, had her calf this week. A beautiful little heifer calf. Momma has been keeping her hidden away for the most part, but Madison wouldn’t go another day without venturing into the field to sneak a peek and some pics. Turns out momma isn’t upset about that at all. The calf isn’t a bit shy either. Most calves don’t take kindly to being bothered, but this little one is different. Maybe Madison is just working her charm. We narrowly averted total disaster with the chickens at Combs 2 this week. During the hottest weather of the year, at the hottest point in the day, a crew of state workers mowing right of ways, broke the county water main. We got very little water from them for the majority of theÂ afternoon. Luckily we have the well and the 5000 gallon resevoir and a pumpÂ for just these occasions. It wouldn’t have taken long at all with no cool cells for the birds to die from the heat. Our service tech came by with our scheduled sell dates for both farms this week too. Looks like September 18th will be the day for Farm 1 and Janurary 1st for Farm 2. Good news is it looks as though we will get 500 FF chicks back for our next flocks. I’ve had alot better luck with these than some other breeds. The down time for Farm 1 this year will be anything but slow. We have already purchased the equipment to do some upgrades. We’ll be adding stir fans and attic inlets as well as a 36″ fan to minimum ventilate with. 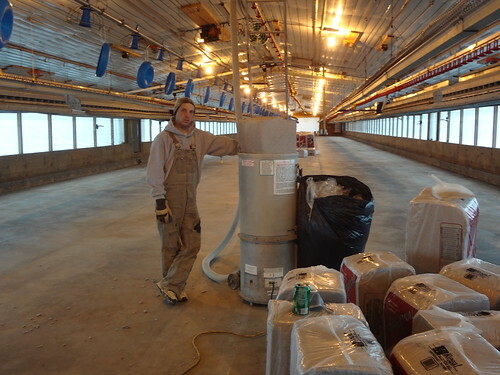 Farm 2 already has the stir fans and attic inlets, but we will be adding the 36″ minimum vent fan there too. We have been approved for state cost share assistance on a litter shed for this year. There are so many hoops to jump through I wonder if it’s worth it. We’re currently being held up by the litter management plan. There’s very few people available to do these. We have been waiting almost 3 months. I’m beginning to wonder if we will make it by December. Especially given how busy we will be in September. Looks like we will be taking the 3316 HST to the doctor soon. The dif lock has stopped engaging. I’ve already talked to the dealer and we’ve decided to put off the repair until after hay season. I’m still kicking tires on square balers. I really like the Massey Ferguson 1837, but even at a 4% interest rate it’s hard to justify spending $16000. I’ve found a used New Holland 570 in Alabama that’s in excellent shape for $7500. It will cost me about $500 to go pick it up. Most likely if it’s still available toward the end of the week I’ll head south to pick it up. 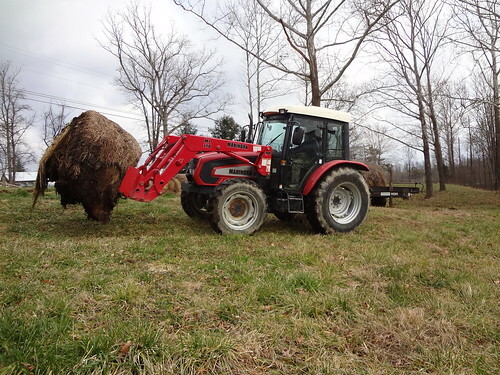 While I was shopping square balers I had the opportunity to spend a little time looking over the new offerings Mahindra is bringing to the game. I’m really impressed with the 35 series. The 8560 cab still has my heart though. 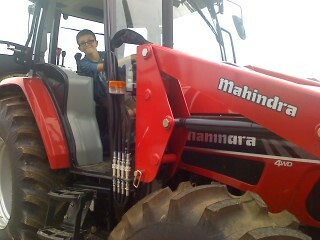 I can definately see this tractor in my future. It was really neat to see my kids crawling all over the tractors. We had my friend Amanda along for the ride and it made me proud as they explained to her what the pieces of equipment on the dealers lot were and how they worked. Well I better get back at it! Lots to do! As always thanks for reading and be sure to check out the pics I’ve added! Things are still clucking right along on the farm. Production at Farm 1 has been good and seems like it will hold on until the end of the flock in September. Farm 2 on the other hand just never produced like we had hoped. That’s the tough part of this occupation. You are at the mercy of all those that come before you. The flock at Farm 2 came in as wild as any I’ve ever seen. We couldn’t even go in the houses without chickens flying in every direction. A chicken that’s that upset just never lays up to it’s potential. It’s also a sign of a pullet grower spending very little time with the birds. The biggest complaint I have with Cobb is that they make no effort to instill an internal customer supplier relationship within their growers. If I get birds that are healthy and even tempered, but don’t produce I’ll not complain one bit. On the other hand when folks before me make no effort to make it the best it can be for us all, I want to cry fowl. 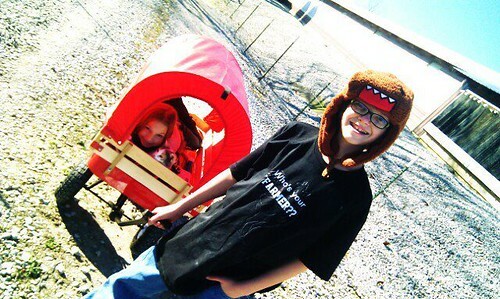 Enough of my complaints…the kids are doing fine. Madison has been at basketball camp at The University of The Cumberlands this week. There’s been some discussion about holding her back a grade before middle school to give her time to develop her skills more. She’s really serious about basketball and I’m not particularly against holding her back simply because I think it would give her more time to mature before heading out into the world. Of course it doesn’t hurt that we’re Kentuckians and basketball is awfully important to us here in the bluegrass state. Garett has been in the summer enrichment program at school this year. It’s been a really cool program. The kids have taken trips to Mammoth Cave State Park, The Louisville Slugger Museum, The Belle of Louisville,Â Fort Harrod State Park, and Shaker Village at Pleasant Hill. Â It’s so hard to believe he’ll be heading off to middle school next year. Kaylee has a summer job babysitting my brother Johnny’s son JT. She’s kind of been off the radar lately. She heads to the high school next year to join Katie. 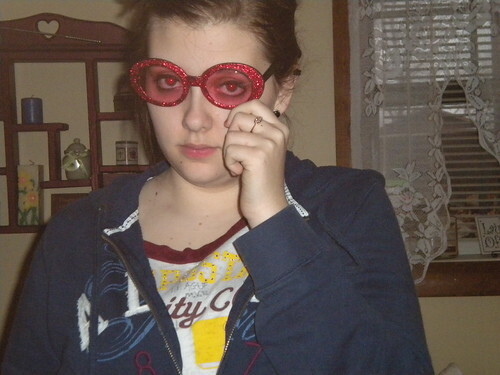 I’m disappointed that Katie didn’t attend upward bound this year. It’s such a great program and it gets kids out ofÂ their comfort zone and ready for moving on to college. 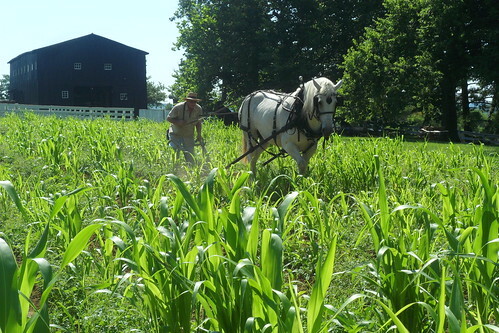 The farm is bustling with its usual summer work. Haying is wrapped up til fall. Now we’ve started mowing the weeds in the pastures. 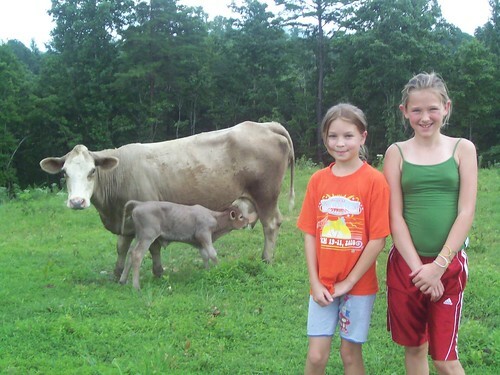 We’ve also added a new bred cow to our herd. The rabbits have about 15 little ones that are not so little any more. It will soon be time to decide which road to take with them. I imagine some will go to the freezer, some will sell, and some will be kept for future breeding stock. I’m still looking for more mature rabbits. I have a goat ready to go to the processor, but his wife has fallen ill and it appears it may be a couple weeks before we can get him in. I sold all my male goats right out of the pasture this year. That’s encouraging and I have more goat friendly places fenced so I’m really enthusiastic about adding more goats to the herd. We have also tackled the baby calves again. Although this time around we have had horrible luck. I was able to pick up 6 calves for almost nothing. Now I know why they were so cheap. Doesn’t seem any of them got colostrum. Out of 6 I have only been able to save 2. I never had that kind of luck before. I did try one thing different that I won’t do again. I tried the community pen theory. In my opinion that’s a bad idea. Whatever one calf has they all get. We like the bottle babies so I’ve started building a place to keep 3 at a time. I’m also adding on to the rabbit hutch. When I’m done I’ll have accomidations for 27 rabbits. As if life isn’t hectic enough around here, the past week and a half has been a real struggle. We had a severe thunderstorm with horendous lightning one evening last week. After it was over we discovered the loud pop we heard during the storm was the well house being hit. Evidently the voltage from the strike ran through the phone lines too. When all was said and done we were out a display board on one controller, an egg belt speed control, the office computer and print/copy/scan/fax machine, the control for the well water treatment pump, and the phones. I know it could have been much worse, but it never makes you happy to see a couple thousandÂ dollars worth of equipment get toasted. The most aggravating part has been finding parts for the Pro Terra Intelligro controller. The local poultry supply folks can’t get Pro Terra parts. I finally found a dealer almostÂ 300 miles away. After over a weeks wait the displayÂ board finally arrived yesterday and I installed it. This is the first time I have regretted not using local people to install my equipment. I saved some money by using out of town folks, but it seems parts and shipping are going to be an issue. Well I’ve got a ton of work to do so I’ll get at it! Thanks for reading. I hope you enjoyed a peek into farm life! As always check out the pics I’ve added to the Flickr site and Facebook. If you Facebook be sure to add us…just look for Combs Farms! God Bless! I apoligize for my long absence. My personal life has become a bit of a trainwreck. Somehow I’ve found myself single and sharing a home with my parents at 37 years old. I try to tell myself things could be much worse…and honestly they could be much worse. It’s never easy sharing a home with mom and dad at 37 though. Just seems that everything happens at once. My mother’s health is failing, my dad has finally retired, and my long term on again-off again relationship with Bj finds itself off again. Somehow in this twisted mess the children seem to be thriving. My mom and dad finally decided to call the farm home again and that makes for a very good support system. There is so much that my parents can teach them. I look around me at all that goes on and even I wonder, how did I accomplish all this? Somehow I’ve managed to build this farm into what it is today while raisingÂ some of the most intelligent, beautiful, witty, and talented children ever. Children you don’t see talking all day on a cell phone or lugging around an Ipod. They enjoy technology, but I’ve not let them forget what’s really important in life. I’ve tried to instill in them this love of the land, the animals, the old folks, and the old ways. Garett started taking allergy injections about 18 months ago and has absolutely come out of his shell. The child who spent most of his childhood inside is now, all boy. He never misses a baseball game, a fishing trip, a bike ride, or a trip to the waterpark. I so enjoy tossing baseball, gardening, and just hanging out with him. 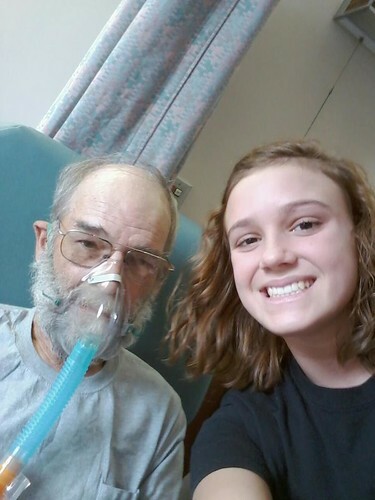 Madison is doing well also. She’s a well rounded child, very much a tom boy. It’s so exciting for me because she is very interested in the farm. I’m thinking she might be the one to keep this place going when I’m gone. It’s so cool to see her saddle up and ride her horse, to see her excitement when there are new arrivals to the farm, to watch her run barefoot in the freshly tilled soil. Katie and Kaylee both are well rounded children too. However they are teenagers and have discovered they really don’t need dad, unless of course it’s to pay the cell phone bill or drive them to some must attendÂ function. They’ve discovered boys now andÂ dad seems to be theÂ foe more than the friend.Â It’s okay, I know there will come a time when I’m neededÂ again. I know first hand it’s not really that easy being a teenager. The farm is growing by leaps and bounds. We’ve had two very rewarding years that have allowed us to improve and expand. I’ve worked hard, but the light at the end of the tunnel is now brighter than ever. 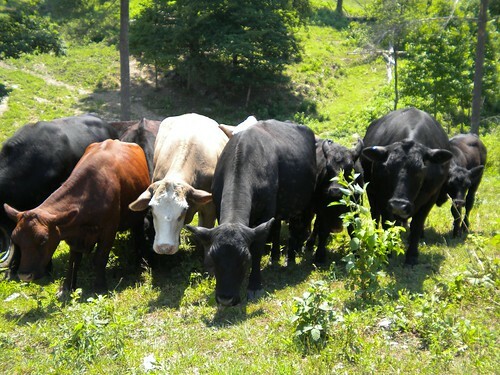 Our herd of cattle has grown to 16. It will soon be time to sell off some of this years calves and invest in more. We have had 9 calves born on the farm this year.Â 20 seems to be a good round number for a small herd. I’ve given up some of my hay ground in an attempt to free up time. I’m still going to be doing atleast 100 rolls and considering squares seriously. I’ve talked to Farm Credit about financing for a new square baler. It’s hard to pass up these low interest rates. My Mahindra dealer picked up the Massey Ferguson line a couple years ago and I’ve been kicking the tires on an 1837 small square baler ever since. It would be great to have squares put up for the horses. 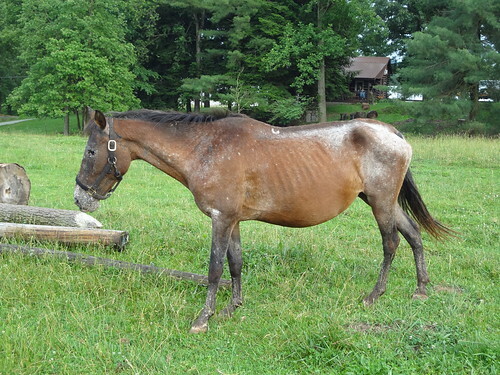 They tend to waste a lot of hay, but I don’t complain for fear of colic. Besides the goats don’t seem to mind leftovers. It’s amazing the job the goats have done cleaning up the area we refer to as the soup bowl. We’ve finally finished the fencing around the cliff areas and in just a few weeks they have made a big dent on the briars and undergrowth. All the tractors are doing great. I’ve decided to put the 6000 up for sale. If it doesn’t sell by spring of next year I plan to trade it in on a smaller 4035 PST. I’m very intrigued by the PST transmission and hope to get to demo one. It seems it would be a perfect fit for working with litter in and around the chickenhouses. We have developed a system that has eliminated all but just a little of the physical labor during cleanout. By using the 3316 HST to move 3 slats at a time into piles of 6 I’ve cut the time expended by about a third. The 7010 has a tough time maneuvering in the houses because of the cab. That leaves using using the 6000 inside and it too is a bull in a china shop. Long term I hope to add an 8560 cab to the fleet for rolling hay and pulling a lime/litter spreader. Recently I stumbled onto an old list I had made of things I needed to take the farm in the direction I wanted. The only things missing were a new square baler and a V rake. Now if I could just stumble onto an old “to do” list maybe I could mark some things off. 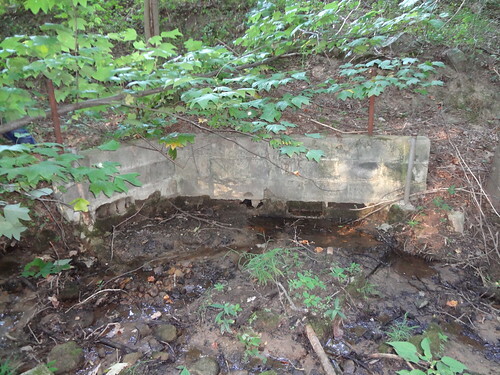 Well I won’t keep you….please be sure to check out our more recent pics and leave comments so I’ll know someone is still there to read! Thanks for reading and God Bless! I know I mustÂ sound like a broken record. Where does time go? It seems like just yesterday that I last posted. Once I stop and look around it’s easy to see where time goes. I’m really proud of all we have accomplished this past few months. I think everyone here on the farm is tickled with how things are too. I know Madison really is. 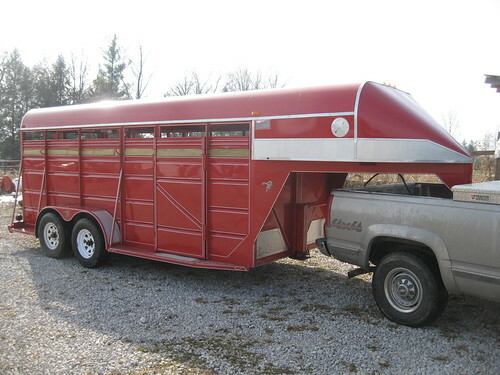 We’ve put off buying a trailer to transportÂ our horses for 2 years. I’m glad to say we finally pulled the trigger and bought a nice trailer. I think it was worth the wait. We were able to find a like new Ponderosa gooseneck for a lot less than I would have paid for a new one. In the process we met some nice folks from the western part of the bluegrass state. The trailers previous owners Kim and Bev Braun own a Buffalo farm.Â I was very intrigued by these animals. Madison and I were all ears and seriously entertaining the idea of getting a few until we found out they don’t mix well with other livestock. We just aren’t willing to give up our cows, goats, and horses. 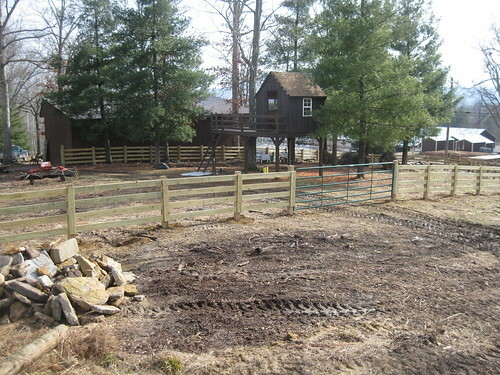 We are rolling right along on the fencing. We have been able to get up a board fence around the treehouse, making a fenced in area for the kids to play without having to dodge droppings. I’m really happy with how it turned out. We even added a small paddock were we can hold the horses when we are waiting to load them. We’ve also started the field fence around the rock shelters we plan to fence in for the goats. Madison decided her big Christmas present this year should be an investment. 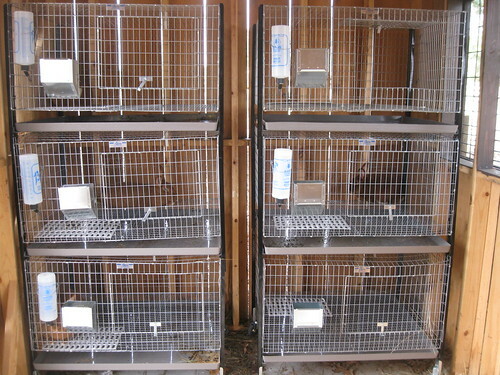 She chose to buy rabbit cages, feeders, and waterers. I fronted her the money to buy 4 New Zealand Red rabbits. As soon as she pays me back she owns the rabbits and gets any money from selling their future offspring. Old man winter has set inÂ on us much more than most years in the past few. To date we have had 4 6+ inch snows and several days with temps in the single digits. I can handle the snow a lot better than the cold. The snow does make it very tough to make any progress toward cleaning out the chicken houses. The chickens at farm 2 sold Jan 2. It only took us 2 days to get all the slats out and get the litter ready to load. We are getting a lot smarter about how we move the slats. In the past we have done the majority of the moving things by hand. This time around we used the 3316 to stack the slats in stacks 3 high, then double stacked the stacks of 3 and moved 6 at a time with the 6000. As soon as I can get another set of pallet forks to fit the skid steer quick attack I plan to use the 7010 instead of the 6000 to move the stacks of 6. That’s as far as we’ve been able to go though because of snow and sloppy weather. While things are going good with the family and in general on the farm I find myself becoming more and more unhappy with my arrangement with Cobb. This years “State of Cobb” meeting really opened my eyes to the plight that contract poultry growers face. In particular we were told how Tyson had a good year and how Tyson and Cobb were investing in several complexes. There was a lot of talk about costs, specifically about the cost of oil. It seemed to me everyone understood costs were going up. They did, atleast until someone in the crowd asked if there would be a cost of living raise this year. At that point we were told we needed to prove our costs were going up. To me that is just another example of the folks with the money doing anything they can to hold onto it. Cobb is in the chicken business. They have chicken houses. They incur the same costs we incur. Afterall we are all raising Cobb chickens. For some reason they need us to prove our costs. It seems certain that they could simply look at their costs and tell that our costs are or are not increasing. They feel the need to make us prove what they already know. I guess what irks me the most is that I’m asked to do this by someone who most likely sees chickens and chicken houses on a very limited basis. Furthermore I’d say it’s been a long time since they worked a week with as many hours in it as me. I get up every morning and work until after dark. I haven’t played golf since I started the chicken housesÂ 3 years ago, can they say the same? I’ve missed so many important functions. Academic team meets. Cheer competitons. Basketball games. Even simple dinners at night. All because I’m doing something on the farm. Somehow though I’m supposed to take more time away from my family and my personal life to prove my costs are going up! Just doesn’t seem fair to me. As far as I’m concerned Cobb can keep their raise. I’m not taking one more minute away from my family to prove anything. It will be very interesting to see how the proposed agriculture law changes shake out. The kids are doing great. They’re growing by leaps and bounds. I cannot believe Katie will be 16 in September. It makes me feel so old to have a child that will be driving. Since this summer we have been talking college choices and possible majors. Somehow she thinks her UK wildcat fan dad is supposed to think it’s okay for her to attend Louisville. The only thing that could be worse would be her wanting to attend Tennessee or Arkansas. Kaylee is cheering yet again this year and will be heading to the Can Am Nationals in Myrtle Beach South Carolina in March for cheer competition. Garett is still being a little bookworm. 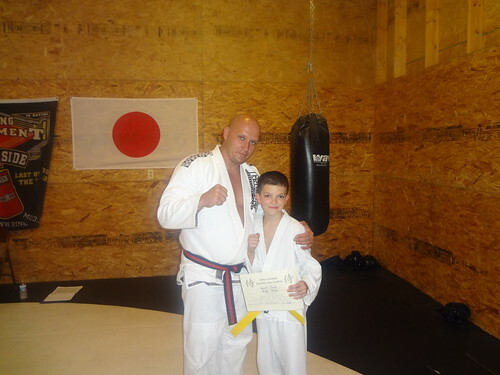 He captained the quick recall portion of his academic team and medaled in Science. He is really becoming intrigued by art. He is strating to pick up sketch pads and charcoal pencils. It seems like he teaches me something every day. Madison is as energetic as ever. She played basketball this year and wants to play again next year and cheer. We are hoping to get her and Kaylee some extra gymnastics lessons. I’ve added a few more pics and will be adding more as time allows. Be sure to check them out. For those of you who wish to follow along on a more frequent basis send us a friend request on facebook to get our daily news feed. Thanks for reading!